These districts were part of the Eighth Circuit until 1929. The court is composed of twelve active judges and is based at the Byron White U.S. Courthouse in Denver, Colorado. It is one of thirteen United States courts of appeals and has jurisdiction over 560,625 square miles, or roughly 20 percent of the country's land mass. U.S. Post Office and Courthouse, as it appeared around 1916. Congress created a new judicial circuit in 1929 to accommodate the increased caseload in the federal courts. Between 1866 and 1912, twelve new states had entered the Union and been incorporated into the Eighth and Ninth Circuits. The Eighth Circuit encompassed 13 states and had become the largest in the nation. Chief Justice William Howard Taft suggested the reorganization of the Eight Circuit Court in response to widespread opposition in 1928 to a proposal to reorganize the nation's entire circuit structure. The original plan had sprung from an American Bar Association committee in 1925 and would have changed the composition of all but two circuits. The House of Representatives considered two proposals to divide the existing Eighth Circuit. A bill by Representative Walter Newton would separate the circuit's eastern and western states. An alternate proposal divided the northern from the southern states. With the judges and bar of the existing Eighth Circuit for Newton's bill and little opposition to dividing the circuit, lawmakers focused on providing for more judgeships and meeting places of the circuit courts of appeals in their deliberations. Congress passed a statute that placed Minnesota, Iowa, North Dakota, South Dakota, Nebraska, Missouri, and Arkansas in the Eighth Circuit and created a Tenth Circuit that included Wyoming, Colorado, Utah, New Mexico, Kansas, and Oklahoma. Three additional judgeships were authorized and the sitting circuit judges were reassigned according to their residence. The Tenth Circuit was assigned a total of four judgeships. The court has twelve seats for active judges, numbered in the order in which they were filled. Judges who retire into senior status remain on the bench but leave their seat vacant. That seat is filled by the next circuit judge appointed by the president. ^ Elizabeth Aguilera (November 20, 2006). "10th Circuit judge's oath a family affair". The Denver Post. Retrieved April 15, 2017. ^ a b c Establishment of the Tenth Judicial Circuit: "An Act To amend sections 116, 118, 126 of the Judicial Code, as amended, to divide the eighth judicial circuit of the United States, and to create a tenth judicial circuit." Federal Judiciary History. FJC.gov. Retrieved September 24, 2009. ^ "Tenth Circuit Act of 1929". Official website of the Federal Judicial Center. Archived from the original on September 26, 2006. Retrieved October 20, 2006. ^ Prior to January 8, 1996, Judge Porfilio was named John Porfilio Moore. ^ Lewis was appointed to the bench of the United States Court of Appeals for the Eighth Circuit in 1921 by Warren G. Harding. 45 Stat. 1346 reassigned his seat to the U.S. Court of Appeals for the Tenth Circuit. ^ Cotteral was appointed to the bench of the United States Court of Appeals for the Eighth Circuit in 1928 by Calvin Coolidge. 45 Stat. 1346 reassigned his seat to the U.S. Court of Appeals for the Tenth Circuit. "Standard Search". Federal Law Clerk Information System. Archived from the original on October 21, 2005. Retrieved June 16, 2005. 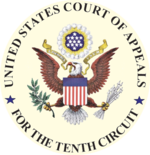 "U. S. Court of Appeals for the Tenth Circuit". Official website of the Federal Judicial Center. Archived from the original on January 1, 2005. Retrieved June 16, 2005.